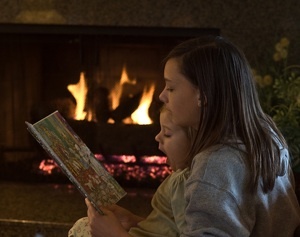 On a cool autumn day, nothing is better than cuddling up with a stack of picture books, a warm fire and a cup of tea. Get in the spirit of the season with a few of our favorite fall picture books. Rebecca Estelle, the main character in this charming Halloween story, hates pumpkins after eating nothing but pumpkin dishes during her poor childhood. When one of the festive orange globes accidentally falls off a truck and into her yard, she tries to bury it and forget about it. The following autumn, however, she is surprised to find a huge crop of pumpkins in her yard. Rebecca learns to overcome her bias against pumpkins and becomes closer to her neighbors in the process. A small boy wakes up in the middle of the night to the sound of a voice calling, “Listen to the night… There’s music in the air…” He sneaks outside to the barn where he stumbles upon a scarecrow playing fiddle and the farm animals dancing up a storm. The rhythmic words and the colorful pictures will make you want to join this barn dance. Leaf Man, with a body made from vivid fallen autumn leaves, takes off on adventures wherever the wind blows him—past farm animals, over meadows and through different scenes in nature. The gorgeous illustrations are collages made from leaves, which are sure to inspire your children to create their own autumn art projects. There are many fall picture books that have a Halloween theme, but this one puts a silly spin on the traditional spooky witch story. A friendly witch finds “room on the broom” for a group of animal companions—a cat, a dog, a parrot, even a frog— to join her in flight. Together, they battle a dragon and learn the value of friendship. It’s a funny, goofy take on Halloween that is acceptable even for small children. Xiao Ming and his friends take a fall excursion to a farm, and he delights in showing them the Mandarin Chinese characters he knows by drawing them in the dirt. The beautiful illustrations bring the words to life, from “fire” to “family,” and a pronunciation guide helps readers learn along with Xiao Ming’s friends. What are your favorite fall picture books? Share your suggestions in the comments.